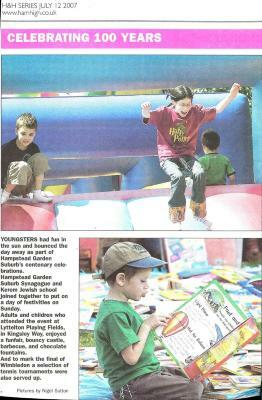 This day of festivities was put on by the Suburb Synagogue and Kerem School on Lyttleton Playing Fields, including fun fairs bouncy castles and tennis tournaments to coincide with the Wimbledon Final. Published in the Ham & High July 12 2007. The Hampstead Garden Suburb Archives Trust is a registered charity, known as Suburb Archives. It is responsible for ensuring that the archives of the suburb are properly cared for and are accessible to all. Built in 1935 the Hampstead Garden Suburb has been at the heart of the Suburb's large Jewish community for nearly 80 years. Series of photos, objects and documents surrounding the celebrations of the 100th anniversary of the founding of the suburb in 2007. A collection of all the different centenaries around the Suburb, from the Suburb itself in 2007 to St Jude's 100 year anniversary in 2011. This collection documents the articles written in and about the Suburb, ranging from resident produced publications such as Suburb News, to local papers such as the Ham and High and national perodicals like The Lady. Collection of photographs and objects documenting the celebrations around the 100th anniversary of the founding of the Suburb in 2007.